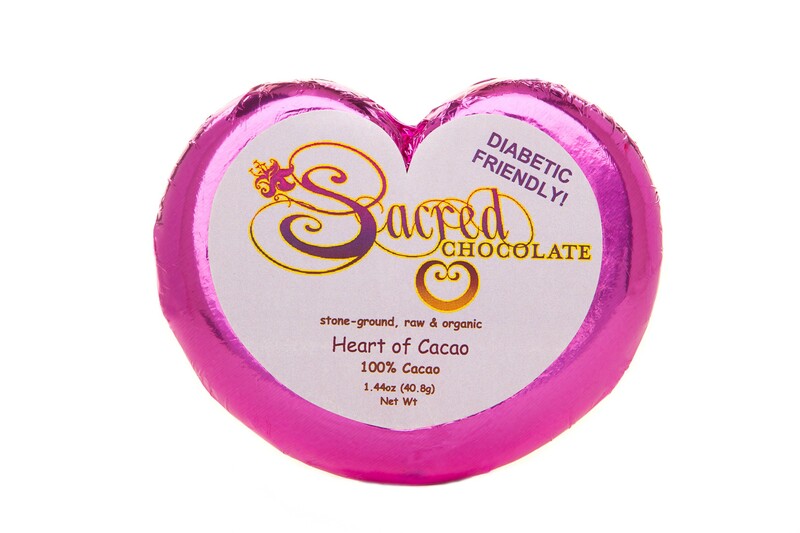 Sacred Chocolate Organic "Heart of Cacao" (100% Whole Bean with FRUIT PULP) is for those who wish to experience pure RAW and UNFERMENTED cacao cold pressed into pure RAW Chocolate! Slowly stone-ground for many days, the TRUE FLAVOR of RAW CACAO FRUIT and SEED in its RAW UNADULTERATED state is fully exposed! It includes the whole cacao bean with the skin/husk and FRUIT PULP still attached for superior nutrition. This amazing CACAO NUT (cacao is actually not a bean!) with FRUIT PULP ATTACHED comes from SRI LANKA. At 100% Cacao Content (and since this is an UNFERMENTED cacao), this is a slightly bitter and TART chocolate and it is safe for people overcoming diabetes. 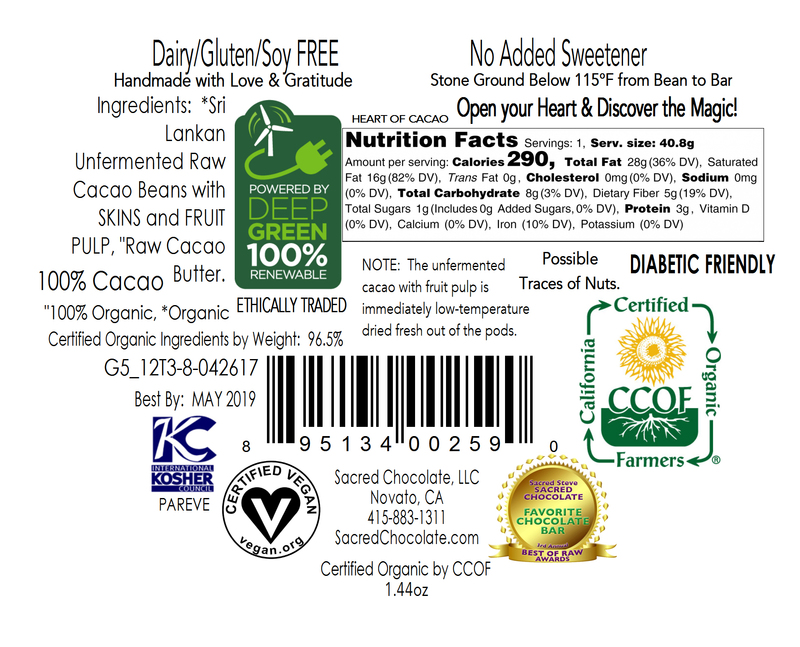 Sacred Heart of Cacao 100% Whole Bean chocolate is slowly stone-ground from bean to bar right in our custom chocolate factory in Marin County, California, which was designed from the ground up to make raw chocolate! Each 1.44oz bar comes in the shape of a perfect golden spiral heart, symbolic of the fact that raw cacao is so good for the heart. This delicious Sacred Heart chocolate bar is hand poured & hand wrapped. All Sacred Chocolate is prayed over by Sacred Steve, the Sacred Chocolate Oompa Loompas and others! *Sri Lankan UNFERMENTED Raw Whole Cacao Beans with SKINS & Raw FRUIT PULP, "Raw Arriba Nacional Ecuadorian Cacao Butter. Certified Organic Ingredients by Weight: 96.5%.